New York, like several other states are no fault insurance states. In New York, if you are involved in an automobile accident, certain expenses are covered regardless of whose fault the accident is. If you are the driver or the passenger, the automobile insurance company of the car you are in will cover these expenses. if you are a pedestrian or a bicyclist, then these expenses are covered by the car that hits you. There are always exceptions to all laws so it is always advisable to speak to an attorney to discuss your rights under the law. All hospital, doctor and other health and medical services expenses (such as prescriptions, diagnostic tests or aids ) that are medically necessary and related to your automobile accident. Up to 3 years of lost earnings, limited to 80% of your earnings up to $2,000 per month. Up to $25 a day in other related expenses such as travel expenses to and from your doctor. Other benefits depending on what coverage you have purchased. The deadline to file for no-fault benefits in New York is 30 days after the accident so it is important to contact your insurance company immediately after the accident. No-fault coverage is included in every insurance policy in New York but the benefits are minimal. If you wish to discuss increasing or expanding your benefits, you should contact your insurance company immediately. Because of all the rules an exceptions involving no fault coverage, you should consult with an attorney to make sure your rights are protected. No fault benefits generally cover you and your family and usually covers any person who is in your car or any pedestrian hit by your car when the injury arises out of the use and operation of the vehicle. 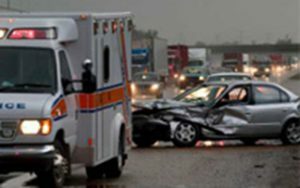 If you are a victim of a car accident or just have a question about your no-fault benefits, call our personal injury attorneys or fill out a free case evaluation form.